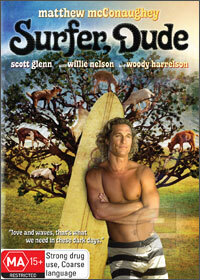 Surfer Dude is a clichéd comedy about a "surfer dude" which is directed by S.R. Bindley that contains almost every surfer stereotype from the locales to the lingo which is used in this film. Matthew McConaughey's is the star billing in Surfer Dude who plays a 30-something surfer called Steve Addington whose life revolves around chasing waves and of course, chasing women. His character is also a "dope head" that unfortunately McConaughey may forever be destined to play the loveable dimwit and his life life is soon thrown into turmoil when her returns from Fiji, after a smoking/surfing and women fest to learn that his surfing Mecca in the US has been taken over by nefarious entrepreneur who wishes to use his looks for a new campaign. To compound the situation of support and negativity for Addington, he is joined by his manager (Woody Harrelson), his mentor (Scott Glenn), his lover (Alexi Gilmore) and probably the best character in this movie, his guardian Angel who is played by the delightful Willie Nelson.. This is where the conflict begins as he dances between corporatism and the Spartan life of surfer that from anyone reading this review will instantly know the outcome of this film. Unfortunately, the movie creators attempted to make an interesting film about a "surfer dude", however it fails on many levels and just becomes another Hollywood clichéd stereotype with no real essence. Featuring good audio and video quality, the DVD also contains commentary from McConaughey, deleted scenes and a featurette on the making of the movie. Consider it Bill & Ted gone horribly wrong!